IT investment ownership has shifted; business decision makers now determine the direction of IT developments for their lines of business based on business value and thus exert a very strong influence on IT spending. In parallel, IT has taken up the challenge and become more business minded, as reflected in the CIO's IT innovation investment priorities and newly found role as a strategic partner and critical driver of business. Given that business now controls the majority of IT spending, IT has been forced to adapt by improving relations with lines of business and its responsiveness to business needs. 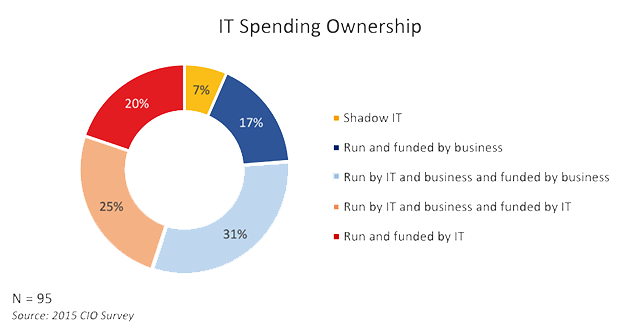 More worryingly, shadow IT now accounts for 7% of IT spending. Although shadow IT represents freedom for the business to experiment with innovative new external IT, it will eventually lead to unmanageable complexity, lack of IT cost control, and security and governance issues if left unchecked. 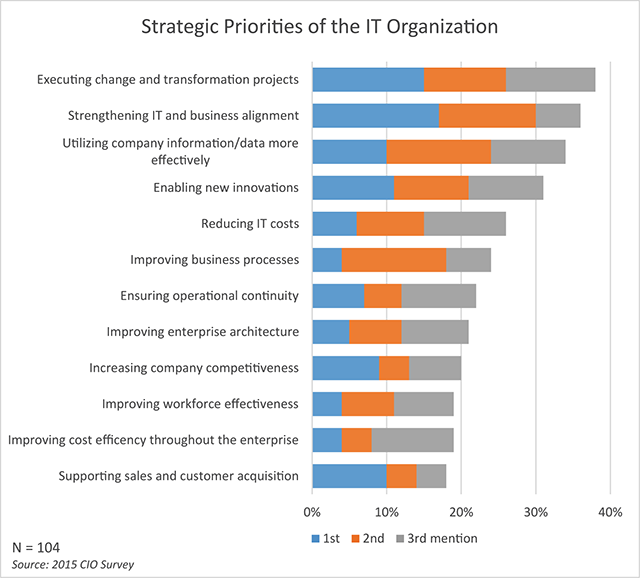 Among the new priorities of the IT department, goals stemming from business needs top the list; 38% of such strategies now center on executing change and transformation projects; strengthening IT and business alignment, utilizing company information/data more effectively, and enabling new innovations follow closely, at 36%, 34%, and 31%, respectively. The goals of reducing IT costs, improving business processes, and ensuring operational continuity are overshadowing the more traditional primary tasks of the IT department. Zooming in from strategic goals to short-term investment priorities, we see a mixed picture of legacy IT systems and longer-term transformation strategies. With 34% of companies citing business intelligence/Big Data/analytics among their top three investment areas, a focus on better usage of enterprise data as the core component of competitiveness is clear. As an example, the datacenter represents a considerable development and investment focus (31%), as does the ever-present need for security (29%). The possibility to reduce spending in areas such as IT infrastructure represents an opportunity to invest in higher business value IT, such as front-office applications (CRM and sales-force automation) and solutions that leverage data assets and improve collaboration and productivity. On the flip side, IT security remains high on the investment list due to intensifying cybercrime, cyberespionage, cyberwar, and cyberterrorism activities. CIOs in CEE are attempting to address key issues associated with digital transformation in the business sphere. CIOs know 3rd Platform technologies are the foundation of business growth and innovation; they consider mobile apps, Big Data/analytics, and private cloud, for example, to be essential business drivers. Likewise, smart operations, the Internet of things (IoT), connected products, and industry-as-a-platform services clearly resonate with a sizable proportion of the CIO community. However, innovative technologies are also the source of challenges that create the very notion of a "digital maze," leading to resistance among IT departments. And some terms associated with the 3rd Platform are considered mere buzzwords – biometrics, artificial intelligence, software-defined everything, enterprise social collaboration, and even public cloudy — and are thus met with ambivalence. This year is shaping up to be one of moderately increasing IT budgets, with more than 20% of companies expecting to spend more on IT than in 2014. Based on response patterns in our survey, it is safe to assume expanded budgets will primarily be used for digital transformation and the closer alignment of business and IT, a reflection of the strengthening position of IT within the organization. Some organizations, however, will face a double challenge: flat or decreasing financial resources coupled with rising expectations from lines of business. C-level managers in such companies regard IT as a strategic investment area, but not one that is decisive in terms of achieving business goals and competitive success. The onus on CIOs in such organizations is thus to demonstrate IT's ability to deliver greater business value. IDC's CIO Summit in Vienna, attended by 250 people (130 CIOs), has come to a close. The theme of the IDC CIO Summit, “Running the Digital Maze,” underlined an agenda that examined the importance of closely aligning IT and business functions in this era of transformation. During two+ days of intensive networking, one-on-one meetings, small group talks, energizing keynotes, and thought-provoking panel discussions, attendees brainstormed how to embrace the digital forces reshaping the ICT industry and disrupting old models, covering such areas as the Internet of things, Big Data, cloud, and mobility and debating who is best placed to wrestle with transformation — the chief information officer, the chief innovation officer, or the chief digital officer. About IDC - International Data Corporation (IDC) is the premier global provider of market intelligence, advisory services, and events for the information technology, telecommunications, and consumer technology markets. IDC helps IT professionals, business executives, and the investment community make fact-based decisions on technology purchases and business strategy. More than 1,000 IDC analysts provide global, regional, and local expertise on technology and industry opportunities and trends in over 110 countries worldwide. For more than 50 years, IDC has provided strategic insights to help our clients achieve their key business objectives. IDC is a subsidiary of IDG, the world's leading technology media, research, and events company. You can learn more about IDC by visiting www.idc.com.